Google released Android 7.0 Nougat update on 22nd of last month. While Nexus and Android One devices are the only devices which have received the update first, it will be quite a while till other manufacturers roll out the Nougat update to their smartphones. However, as far as Sony is concerned, the Japanese company will start rolling out the Nougat update some time next month. The roadmap for Sony’s Android Nougat update for its devices was leaked during a press conference held by Sony Slovakia. Soon after Nougat was released, Sony had shared list of devices which were going to receive the Nougat update. However, there was no specific timeline as to when the update would be rolled out. Well now, according to the leaked roadmap, it seems Sony Xperia X Performance and Xperia XZ will be the first devices to receive the Nougat update in October. The Xperia X and Xperia X Compact will receive the update in November in the second phase which will be followed by Xperia Z5 Series, Xperia Z3+ and Z4 tablet in December. 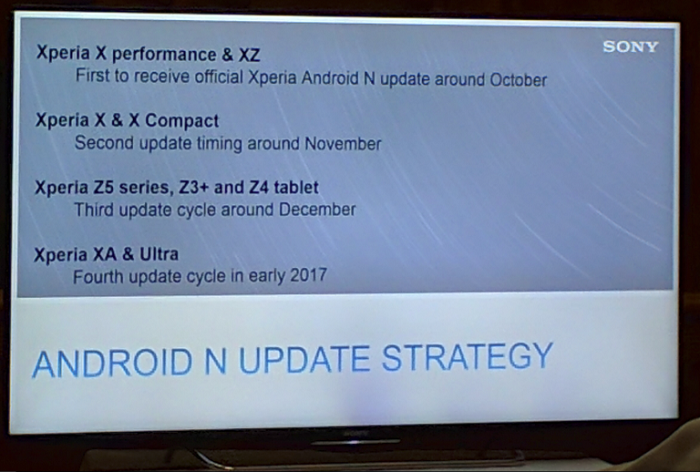 Talking about the Xperia XA and Xperia XA Ultra, both these devices will receive the Nougat update in early 2017. Well, we wonder what Sony actually meant by “early 2017”. It could be January or February, you never know. The devices mentioned in the roadmap are the same devices that were mentioned in the official list of devices which will receive the Nougat update. No new device has been added. Well, it remains to be seen if Sony actually sticks to this roadmap or the users will have to keep waiting for the update.